25 weeks arrives tomorrow (which basically means it took me three days to write this since as I hit publish I'm at 25+1) and I have been meaning to add another update for all of week 24, which ends in all of two hours (if I manage to finish this post tonight). I went to my doctor's appointment last week and discovered that my doctor learned about my repeated calls the entire week between the hospitalizations, after he readmitted me to the hospital the second time. You see, after I came in sobbing and was re-hospitalized with a kidney infection, he went back and looked in my chart and was surprised to see I'd been calling all week long complaining of being in terrible pain. So when I brought up my concerns about being afraid of not being listened to if I called in, as had happened all week, he explained that it had been discussed and that the people involved knew that I had ended up back in the hospital as a result of what had happened. And then I explained a little more about how the conversations had... unfolded... (like when I said I was in terrible pain and I was told "well you sound better, so that's what I'll be telling the doctor." except apparently no one was telling my doctor anything at all.). However at the moment it seems that both the flu and the kidney infection are behind us (I hope! I really, really hope!). The kidney pain is slowly getting better and better, but it's flared up a couple times (like this morning! Stairs are harder on kidneys than one would imagine when they're healthy) with enough intensity that I was willing to agree to the every day antibiotics for the rest of the pregnancy to prevent it from coming back again. About a week into the four times a day antibiotics the pain came back pretty sharply, and we narrowly missed having to head back to the hospital, and so I'm pretty set on avoiding that happening again if it's at all possible. Patch is talking up a storm. I'm pretty sure that at the end of the year he won't need an IEP anymore, or speech. He tells us exactly what is on his mind all day long. Every time he sees a farm he starts yelling "Home! Home!" out the car window. In other news, a certain someone is thriving since starting a daily migraine medicine. After trying a few other things (magnesium...) and tracking Maggie's migraines since fall, I agreed with her neurologist when he suggested that something preventative was in order. During the whole of January and the first half of February she was having about 15 instances a month of her pupils being dramatically different sizes, and besides that she seemed to be having obvious headache symptoms at least once a week, so I went to the pharmacy and picked up the bottle of tiny pills. After two days I asked Paul if he was seeing what I was seeing, but he wasn't quite sure. By the end of the first week there was no doubt, and he was seeing it too. She was calmer and more social at home. Instead of going upstairs and laying down in her bed and pulling the covers up over her head (a definite clue on headache days) she would stay downstairs and play. She's less likely to cry if her sister coughs. And she's just all around happier. We seem to have found something that's working and I'm hoping that as I continue to track the differences in her pupils we see a dramatic reduction there as well (I've been watching and I think it is less, although it still happens occasionally... three times this month so far, instead of around fifteen). We did have one major meltdown this week. It involved going on a shopping trip. Everything was going well but the boys were fussy, so in between stores we decided to swing by a park that was nearby. 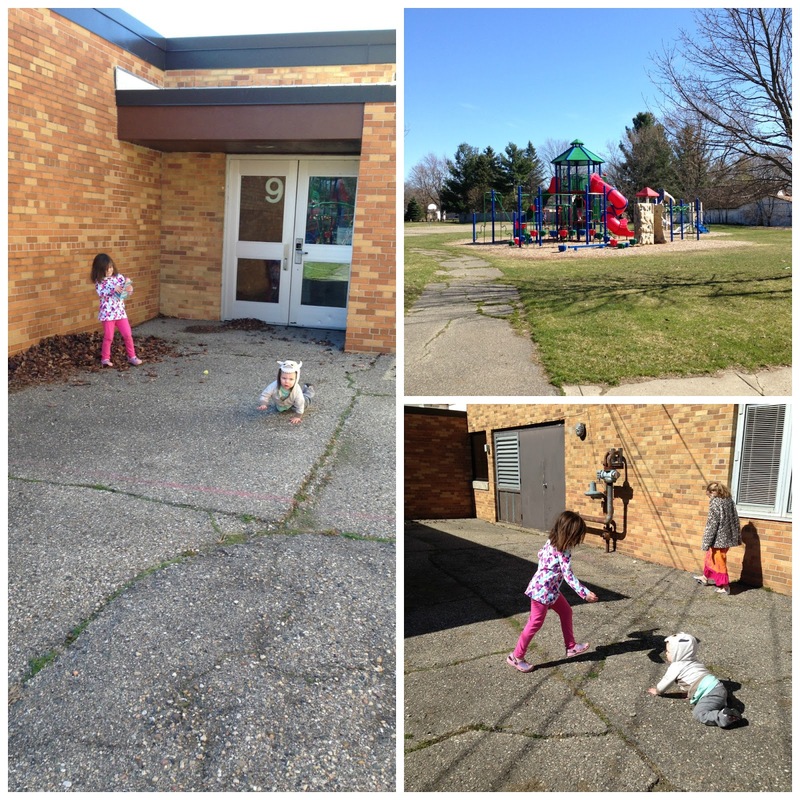 The park happens to be at the converted school/autism center where Maggie goes for speech therapy once a week. We've gone here before just to play and it's been fine, but this time I didn't talk about how we were just going to play before hand. Big, big mistake. We arrived and Maggie got out of the car and bolted towards the front doors (which were locked because it was the weekend). I realized my mistake. I took her hand and led her towards the playground, explaining that there was no school today, we were just there to play at one of their three awesome play grounds. She could not be convinced. She kept telling me "Homework! Homework!" (I'm not even sure how she knows that word) and trying to go back to the doors. Tears followed. Finally, after a very long five minutes, she found a pile of leaves near one of the doors on the playground side and decided to play with Baby Mermaid over in it. Her siblings all joined her, ignoring the play structure. On a final note we had a major victory yesterday. It took the form of a tiny conversation. As we were walking to the car for speech, with Maggie's little hand clasped in mine, I heard her tiny voice say "My tummy hurts me!" I stopped and stared at her. A sentence? With two pronouns that were actually correct? And that were telling me something? "Did you just say 'my tummy hurts me'?" I asked. "Yeah." She said and then climbed into her car seat and waited for me to buckle her up. And suddenly I had information that I could use to help her, information that with our tough little girl, I never would have been able to figure out on my own. I may get a few dozen fragments about mermaids a day, but that sentence is a huge deal around here! And that is the latest as we embark upon these last days until Easter! This Lent has been a unique challenge this year, but we're in the home stretch! Yay, Maggie!! She is a Rockstar!!! Also, you're probably already doing this, but when I had kidney problems a couple years back I was on antibiotics for a long time and learned partway through that a daily probiotic helps keeps your tummy happier. Pro tip. ;-) I hope you keep feeling better! You are such a trooper, Cammie! I second the probiotics. I had a rough time when I was pregnant with my youngest when I had a pretty serious strep infection in my hand. Taking a probiotic one for one for every antibiotic dose I took made a world of difference. Now I don't take antibiotics without taking probiotics, too. Maggie has made such progress! And she is breathtakingly beautiful. Reading your story about the kidney problems and outrageous treatment at the hands of medical staff who should have been helping, makes me very angry. (At this point, I would be composing a well-crafted, scary letter, because having things in print makes me feel better and forces people to take things very seriously.) So glad you're feeling better. Don't overdo. From another mom of a kid with migraines, I'm glad the medicine is helping her! It took several tries to find a medicine that helped his migraines but didn't negatively affect his behavior (Definately ADHD, trying to rule on OCD, asburgers, and bipolar...he has symptoms of all, but not quite enough to meet criteria for any of them). But it has made a world of difference, and his ability to concentrate has improved enormously. I am so glad you've found a way to help Maggie! That's great! I am also happy to hear you are starting to get back to normal health and your OB discussed your concerns with you. Hooray for Patch!